It is 100 years since the British and Norwegian teams, lead by Scott and Amundsen, battled against high winds, sub-zero temperatures in their journey to be the first to the South Pole. If you remember your history, Scott and his team came second. Not only were they beaten by the Norwegians but they were trapped in their tent, by a terrible blizzard, on the return journey. Here, exhausted and demoralised is where they died, having run out of food. However, what they ate in the previous months is one of the main reason why Amundsen was successful but Scott was not. Nutrition has come a long way in 100 years, but in 1911 the value and importance of vitamins was not fully understood. In particular Scott’s team started the journey deficient in vitamin C and the B vitamins, whilst the wortleberry jam enjoyed by Amundsen’s team gave them a small amount at least. 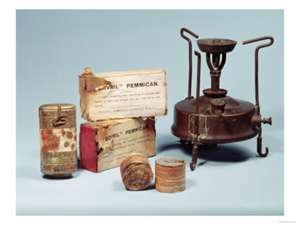 Daily rations during the walk to the Pole were pemmican, biscuits, cocoa, tea and 12 lumps of sugar. Pemmican is a mixture of fat and dried pieces of meat. It is mixed with water and heated to make a stew called “hoosh.” These rations did not provide enough energy, let alone variety. Not surprisingly, after days on these rations, food was either talked about or dreamed about as the men were slowly starving. The most popular fantasty meal was well seasoned mince meat, wrapped in thick slices of bacon with plenty of fat and covered with buttery pastry layers, fried in lard and eaten piping hot. Vitamin C is not made by the body and so must be provided by foods. The well known deficiency disease is scurvy but long before this stage is reached muscles turn sore and weak, old wounds open and new ones don’t heal. The B vitamins are involved with energy release, brain and nerve function. Amundsen’s rations included biscuits enriched with oatmeal and yeast – which would have provided a source of these vital nutrients. Scott and his team however suffered from the symptoms of B vitamin deficiency – anaemia, low energy, nerve damage, skin rashes, mouth ulcers, hellucinations and depression. Constantly feeling exhausted, confused, with painful mouth ulcers and blisters that will not heal is bad enough at home but becomes intolerable whilst shivering in a tent in the Antarctic. Modern expedition food is now designed with a greater knowledge of nutrition and understanding of the power of food and performance. Food is vital to power the body and to keep the mind at peace. My role is to design the eating plan for the environment and challenge. However, the adventurers and explorers, I have worked with, also seem to have an extra dose of mental strength – which helps them to push their boundaries.